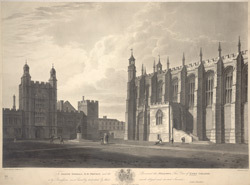 View of Eton College near Windsor (on the Buckinghamshire side of the river) in the 18th century. It shows a gatehouse range and the side of the College Chapel, one of its most impressive buildings. It was begun by Henry VI in 1441, and rebuilt 1449 - 1461 and 1469 - 1475 on a larger scale. The College Chapel can be compared with other great Royal Chapels built in the same period such as King's College Chapel, Cambridge, St George's Chapel at Windsor, and Henry VII's Chapel at Westminster Abbey. The remainder of Eton's buildings are of varying ages, and are built around quadrangles.